During your first couple weeks on the ketogenic diet, you’ll need to figure out the answer to an overwhelming amount of questions. Does this have too many carbs in it? It will be like the decision-making Olympics for you to get everything you need to adapt to the ketogenic diet lifestyle. This is why we decided to do all of the dirty work for you to make your transition to keto much easier. This keto shopping list gives you the average cost for the minimum amount you will need to get to make the keto-friendly recipes that follow. Prices will vary depending on where you shop and how much of each item you purchase. Reduced sugar ketchup, for example, will not come in a 1 oz size (as required for one of your recipes), and it won’t always cost around 25 cents per ounce. However, for ingredients like ketchup that have a longer shelf life, you can buy the bigger size without worrying about it going to waste. Plus you will more than likely use most of these ingredients again, so getting a bit extra will only cut the costs on your next bill. *an asterisk marks items that you may be able to buy for lower prices online (e.g., Amazon). This list covers everything that you should be able to find at the grocery store. However, you might still struggle to find items like watercress and reduced sugar ketchup. In this case, you can either try another store that has more fresh produce and health-conscious options, buy the item online and get it shipped to your house, or swap in a different ingredient that is more easily accessible. For example, instead of chasing down the wild watercress, you can use another green that you like (baby arugula, sweet baby lettuce, etc.). Don’t head off to the store just yet! We still have a couple more items to get. However, you are better off buying these remaining items online. If you were able to get all of these items at a reasonable price in the quantity that you needed for the week, then you would only spend around $59. However, keep in mind that you will be spending much more than just $59 a week on keto at first. Your grocery bill depends on your local market, current sales and coupons, product availability, bulk purchasing, brand and other purchasing preferences, and willingness to go the extra mile to find the best deal around. A great way to save more money, in the long run, is by investing in larger quantities of the foods that you eat most often and store them appropriately. This is one of the many suggestions you’ll find in our Eating Keto on a Budget Guide. In it, you will find everything you need to know to save money on the ketogenic diet. You’ll be implementing some of these “keto on a budget” strategies simply by following this one-week meal plan. Many of the meals provide you with extra servings that you will need to freeze or refrigerate for the next day or week. Here is what that long keto-friendly shopping list will get you. 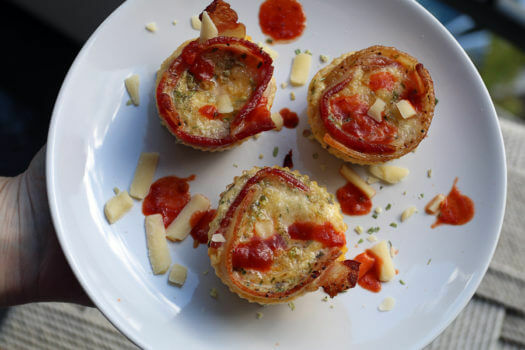 These muffins are so easy to make and so fulfilling that they are now my go-to breakfast. If you cook them in bulk, you can have breakfast for the entire week! Another simple and savory breakfast frittata to start your day off with. Add in some of your leftover spinach or broccoli for an extra health boost. 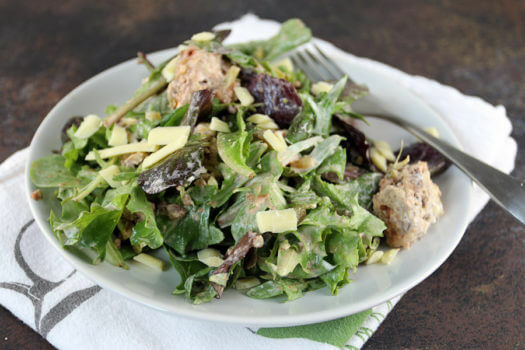 This salad provides you with a delicious way to get some healthy fats, fiber, vitamins, and minerals. Feel free to use whatever greens you prefer (e.g., baby kale, arugula, and sweet baby lettuce). Double the serving or add a leftover frittata on the side for a more filling lunch. Here’s a lunch where you will have to use your hidden creative genius to come up with a culinary masterpiece. Well… not really. All you have to do to put this salad together is throw some of your bacon cheeseburger casserole leftovers (or beef, cheese, and bacon) on top of your extra greens. 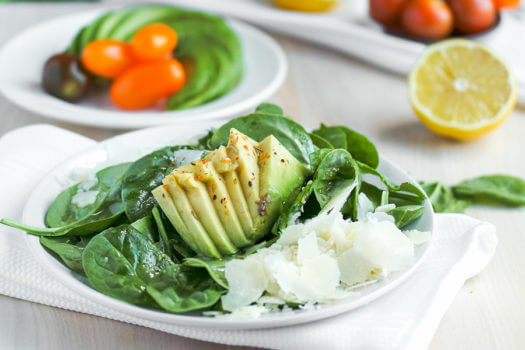 For example, you can put your leftover watercress and spinach in a bowl and toss it together with some olive oil or avocado oil and lemon juice or vinegar. Put a leftover serving of your bacon cheeseburger casserole from the night before on top (the next recipe on our list), and you’ve just made a delicious salad. Hearty, tasty, filling, and you’ll have plenty of leftovers. 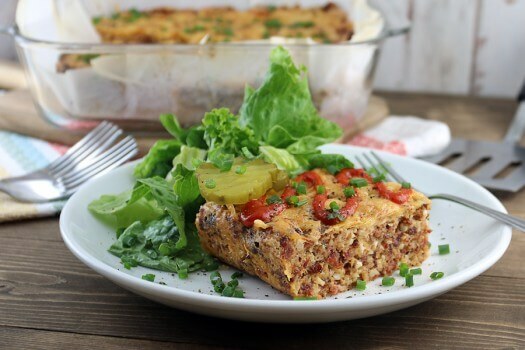 This bacon cheeseburger casserole is a staple dinner for many ketogenic dieters. Ok, that’s enough meat for the week. 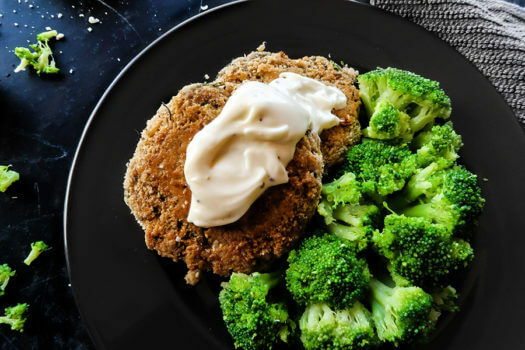 Let’s switch it up with some delicious salmon patties. They are perfect for someone who’s looking to add a little bit more seafood to their diet, but feels a little trepidation about cooking fish. These salmon patties come together in a snap and don’t require a complicated, or messy, breading station. Combine them with a side of your choice for a deliciously healthy meal. 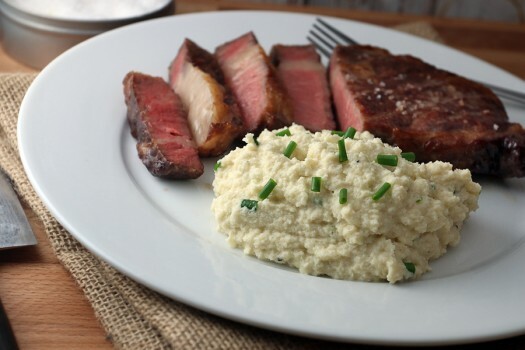 Love mashed potatoes, but can’t have them on the ketogenic diet? Try these cauliflower “mashed potatoes.” They are creamy, delicious, and the perfect side dish to have with your bacon cheeseburger casserole or your salmon patties. It doesn’t get much better than this broccoli side dish. Not only is there subtle hints of lemon and acidity running through the broccoli, but the saltiness of the cheese and the spice of the chili flakes bring everything together as a whole. 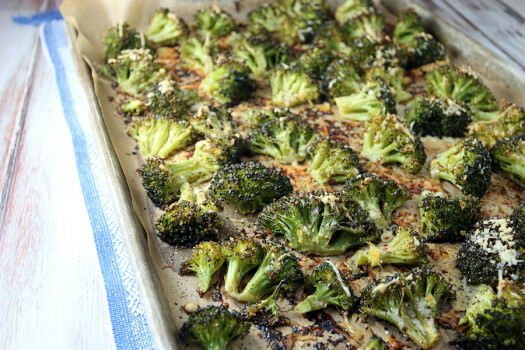 All it takes to make this delicious side dish is preheating your oven, seasoning some broccoli, and stuffing it in the oven for some fantastic hands-off flavors to develop. Got that sweet tooth that you just can’t satisfy? 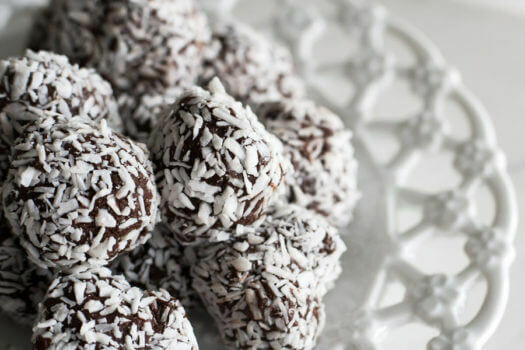 You probably can with these peanut butter balls! They taste exactly like a peanut butter cup without the sugar. 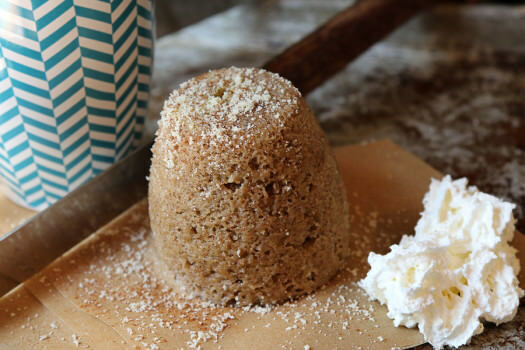 Yields 1 Mug Cake — $1.48 per mug cake. These churro mug cakes are pretty darn good. They are a lot like the real thing and will totally satisfy your sweet tooth. Not getting enough calories by eating these meals? Add a serving (or two) of your favorite leftovers to each lunch. By using this shopping list and these recipes, you will have plenty of food for the week. If your lunch salads are too small or if you run out of greens, simply have a leftover breakfast frittata, casserole serving, or salmon patty serving (with a vegetable side dish if needed) to supplement or replace your lunch salad. 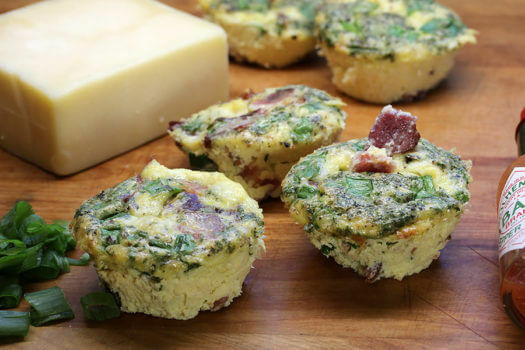 Don’t worry about running out of food — by following these recipes, you’ll have about four extra servings of dinner, eight extra breakfast frittatas, two additional servings of side dishes to eat throughout the week, and plenty of keto-friendly sweets. However, just because you are following this one-week keto diet plan doesn’t mean you will eat exactly what you need to meet your goals. Make sure you are diligently tracking your calories to make sure you are getting enough fat and not eating too many carbohydrates. To figure out your daily macros and track them properly, use our keto calculator and carb tracking guide. The number of servings you should eat per day depends on your calorie needs. Click the link for each recipe to find macronutrient breakdowns of total calories, fat, carbs, fiber, net carbs, and protein for each meal. Use this information to figure exactly how many servings you need to eat to meet your goals. If the 7 days of meals sound good to you, feel free to put it to the test. Below, you can download a printable PDF of the shopping list and recipes! Not a fan of some of these foods or recipes? Check out the ketogenic diet food list and our keto recipes page to personalize your shopping list and meal plan. Would you rather someone else do all of your keto diet planning for you? Try out our 30 Day Ketogenic Diet Plan. 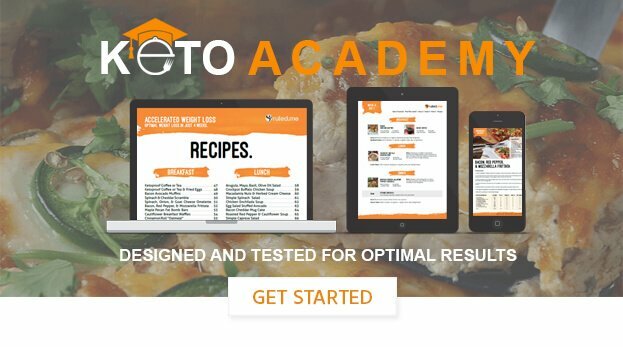 However, if you’re looking for the easiest way to implement the ketogenic diet with the long-term best results, join our Keto Academy. There you have it — almost everything you’ll need to follow the ketogenic diet successfully (at least for a week). However, it is important to remember that the cheapest foods aren’t usually the healthiest foods, and the production of these foods may be harmful to the environment as well. If you want to get yourself the healthiest food that is simultaneously healthier for the animals and the environment, then here are some shopping tips for you. Although the highest quality foods tend to be the most expensive and harder to find, there are some tricks you can use to shop for a better you and a better environment that won’t put you into debt. Most dairy you will find on supermarket shelves comes from cows that are raised in controlled animal feeding operations (CAFOs). If you are not sure what CAFOs are, then picture the most atrocious conditions that you’ve have seen any animal live in and multiply that by 100. On top of the abuse that these dairy cows have to go through to make your milk and cheese, the waste that is created by raising the cows in this way pollutes the soil and water and accelerates climate change. Chickens go through a similar hellish process to provide us with their eggs. When it comes to eggs and dairy, organic doesn’t mean much at all. Organic cows and chickens can still be packed inside warehouse-like buildings and fed things they aren’t designed to eat. For this reason, it is best to look for dairy and eggs that come from sustainably pasture-raised animals. S. Wellness Meats for 100% grass-fed pasture-raised cheese and butter. This is another food category where organic doesn’t mean much. However, the same principles from the Dairy and Egg section apply here. Find animals that are raised on pasture in a humane and environmentally-conscious way. When it comes to fish, always look for wild-caught (not farm raised). Vital Choice will ship fresh, wild-caught fish to your door. Wild Planet also has many wild-caught canned fish products that you can find in various grocery stores, on amazon.com, or on their website. Now organic matters. Getting organic vegetables and fruits when possible will help reduce the amount of pesticides you are exposed to. To support the environment as well, buy local, biodynamic/”beyond organic” produce. Buying local cuts down on the gas needed to get the food to your shopping cart, while simultaneously supporting the livelihood of local farmers that are improving the environment. Biodynamic and “beyond organic” farming practices take a more holistic approach to growing food that considers the environment as a whole. You may even be able to find high-quality produce that is cheaper than conventional fruits and vegetables. Buy organic oils and condiments when possible, and find out where they actually are coming from. Olive oil specifically has a lot of controversy surrounding it because many “olive oil” companies are selling vegetable oil and claiming that it is 100% olive oil. When buying olive oil and all other oils, make sure they aren’t processed at high temperatures. When exposed to high temperatures, the oils can become rancid and unhealthy. Also, avoid oils that are bottled in plastic. Most plastics leach out harmful chemicals when exposed to heat, and they aren’t biodegradable. For fresh herbs, aim to buy locally grown, organic herbs or grow your own (it’s super easy). The same goes for dried herbs and spices as well — buy organic or cultivate, dehydrate, and process them yourself. To cover almost all of your dried herb and spice needs, buy this organic starter kit. For these wide-ranging categories, keep it simple and organic. By keeping it simple and organic, I mean that the products you buy should only have the ingredients that are implied by the name. Most types of peanut butter contain added sugars like honey and high fructose corn syrup, even many “natural” peanut butters have added sugar. The same goes for dehydrated coconut and cocoa powder. Always check the ingredients. If there are added carbs or chemicals, put it down and find another product. By following the suggestions above, you can make better decisions for your health, animal health, and the health of the environment. However, don’t get caught up in trying to implement them all at once — you can easily stress yourself out by approaching your health in this way. Instead, make the changes that you feel comfortable with making now, and revisit this article later to improve your diet even further. Buy pasture-raised eggs, dairy, and meat. To find out if they are genuinely pasture-raised, get to know where your food actually came from. If the conditions the animals live in aren’t as close to wild and natural as possible, then don’t invest in that food. Do a quick search on Eat Wild and Local Harvest to find reliable pasture-raised animal products near you. Get the highest quality pasture-raised meat, dairy, and eggs shipped to your house. The best sources for dairy, meat, and eggs are S. Wellness Meats, White Oak Pastures, and Udder Milk. Eat only wild-caught fish. Some good sources of wild-caught fish are Vital Choice and Wild Planet. Buy local and biodynamic/”beyond organic” produce as much as possible. Plug in your location on Eat Wild and Local Harvest to find the highest quality food in your area. Get organic fruits, vegetables, herbs, and spices whenever local and biodynamic produce isn’t available. By paying the extra cash for organic, you will reduce your exposure to harmful pesticides. Look for high-quality oils. Never buy any oils that are processed at high temperatures, and make sure your olive oil is actually olive oil. Get organic oils whenever possible. Read labels carefully. Look for hidden sources of carbohydrates and chemicals that you don’t want in your food. Buy simple and organic ingredients whenever possible. Print this list out along with your shopping list so that you can make healthier decisions as you shop. You can also apply these suggestions during your 30 Day Ketogenic Diet Plan and while you “attend” The Keto Academy.